The comfortable and stylish suites, leafy gardens, poolside loungers and chic restaurant and bar mean you never need to leave. An unanssuming building fitting in on this historic street, which opens up into a luxorious and elegant five star. 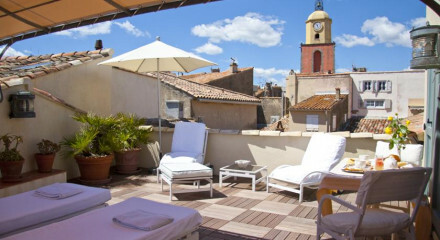 The hotel is only a ten mnute walk from the delightful Place des Lices open-air market in the heart of St.-Tropez. Only a three minute walk from the Port, charter a boat and head out to explore the Riveria. Rent abike from the hotel and explore the town. A ten minute drive from the hotel brings you to Pampelonne beaches where you can rent kayaks, jet skies etc. The hotel is located at the foot of Saint-Tropez citadelle, a major attraction.